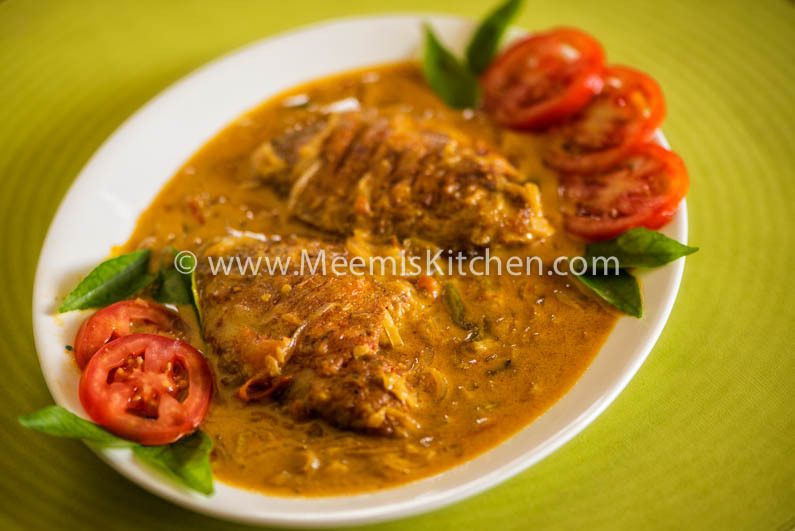 Karimeen Mappas is an extremely delicious, traditional Kerala Fish curry. 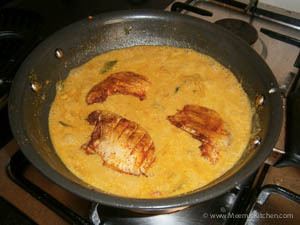 Karimeen/ Pearl Spot is cooked in a spicy coconut gravy. Rich in flavors and spices, Karimeen Mappas is really incredible and is a much desired fare during special occasions. Mappas curry is a specialty dish in Kerala, and Karimeen Mappas, Beef Mappas, Cauliflower Mappas, Kadachakka Mappas, Vendakka Mappas etc. are very popular Mappas dishes. The coconut milk provides a creamy texture to the Fish Mappas gravy, making it extremely delicious. Karimeen / Pearl Spot can be rightly called as “Icon fish” in Kerala, as Karimeen have exotic taste, and is usually expensive. It is featured as a top delicacy in all posh restaurants and a must try dish for all tourists. In Alappuzha region, house boat rides are considered incomplete without Karimeen varieties and Tharavu Roast for Lunch; a true way of experiencing the “Taste of Kerala”. Meen Mutta Thoran, Chemmeen Ularthiyathu, Sqiud Roast, Kakka Erachi, Alleppey Fish curry,Mathi Peera Pattichathu , Chemmen Chammanthi, Karimeen Thilappichathu, Fish Molee, Beef Roast etc are all much savored and sought after dishes here. Karimeen fish bones are very hard and one have to be extremely careful while eating them. Even cleaning the scales is an art; you need to cut/ peel the scales off from the sides with a sharp knife, keeping the white skin intact. Some people just take the scales off which leaves a black mark, and then brush it against a stone to take out the black skin. I learned to clean Karimeen from mummy (my mil), and most of the times get a white clean fish, though I am not an expert like mummy or Kochammu. Karimeen Mappas is a much coveted dish in my home, but I make this fish curry only for special occasions! Karimeen Mappas goes well with Vellayappam, Appam, Idiyappam or rice. Hope you will try my special Karimeen Mappas soon! Karimeen/ Pearl Spot : 3 nos. Green Chilly : 3 – 4 nos. Cashew nuts : 10- 15 nos. Clean the Karimeen/ Pearl Spot nicely. Make small gashes on both sides and keep aside. Mix all marinade ingredients with just enough water. Coat the Karimeen with this masala. Heat coconut oil in a pan and very slightly fry the Karimeen; be careful not to brown. Keep aside. Heat another pan and pour the oil used for frying without grains. 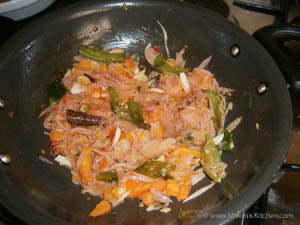 Add whole Masalas, thinly sliced Onions, chopped ginger, garlic and slit green chilies and sauté. When limp, add chopped tomatoes and fry for another two minutes. Then add Coriander and Turmeric powder, Garam Masala Powder, Chili Powder (optional) and sauté. Add cashew paste and fry for some time. Then add 1 tsp vinegar and mix well. 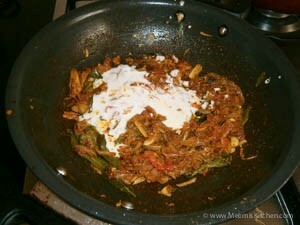 Now, add the light coconut milk (Randaam paal) and bring to a boil. Adjust the salt and add the fried Karimeen (Pearl Spot) to the gravy. Cover and cook for few minutes. Now add the thick Coconut milk and swirl the pan slowly to combine well. Switch off the flame and transfer to a serving plate. Decorate with thin round tomato pieces. Serve hot with Idiyappam, Appam or rice. Green chilly should be medium spicy. If it is too hot, add less. You may add ½ tsp Garam Masala instead of whole spices, to give a different flavor. Red chili powder is optional. If you like it spicy add the Chili Powder, it gives the gravy a slight orange color. You may add Pepper Powder 1/2 tsp instead of Red chili pdr. You may also add Karimeen without frying. Slightly frying holds the fish intact and tastes more delicious. 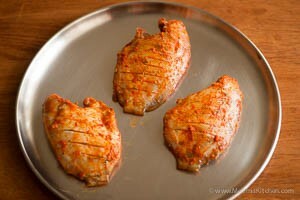 You can also do this with white Pomfret (Vella Avoli). Please try and let me know if you like it through comments. You can also share this recipe with your friends. God Bless!! Your recipies looks very tasty and delicious.please tell me which vinegar to use apple cidar or Kerala fruit vinegar which brand will be good.pl mail the response .